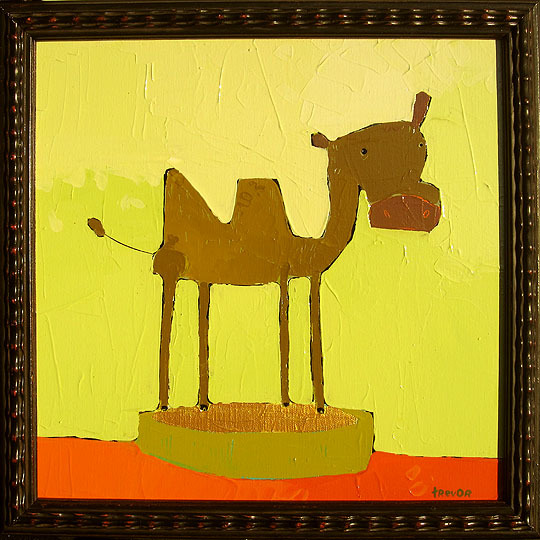 An artist’s "style" often emerges from an interest in a certain subject. But what characterizes his or her paintings is the interpretation of that subject. Is it abstract or figurative? If it’s the latter, does the artist portray realism, or a more personal means of expression? 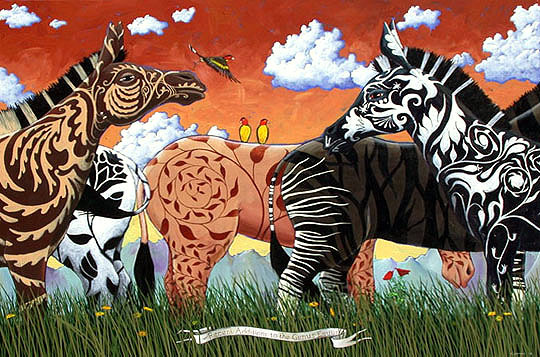 ﻿﻿﻿Timothy Chapman’s animals are a unique group. Many of them are floating – and they’re not always birds. Their hides do not have the traditional markings, and some appear to be a newly created species (by Timothy). A sense of wonder as well as humor is the thread that ties his work together. 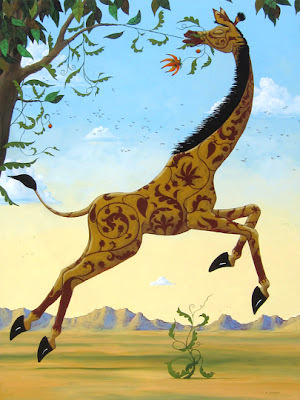 According to Timothy (who studied biology in college), his paintings owe a lot to his fondness for earlier styles of depicting animals, particularly the copperplate engravings that illustrated Buffon's Natural History, as well as Victorian animal portraiture and old scientific illustration. Since there was no photography at that time, the images are not always correct. "I have tried to present similarly earnest, but basically inaccurate, renderings of animals by using humor, irony and surrealistic sensibility that’s not available to the scientist," he said. Since Timothy gives himself permission to be creative with his animals, he has painted "The Antlered Lagomorphs of Western North America," depicting four hares with different antler-style head gear. 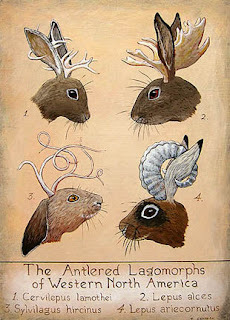 Could this be a new breed, like the Jackalope? "What I want most is to impart to the viewer a sense of wonder and strangeness that nature photography and video, in spite of their inherent capacity for precision, cannot," Timothy explains. 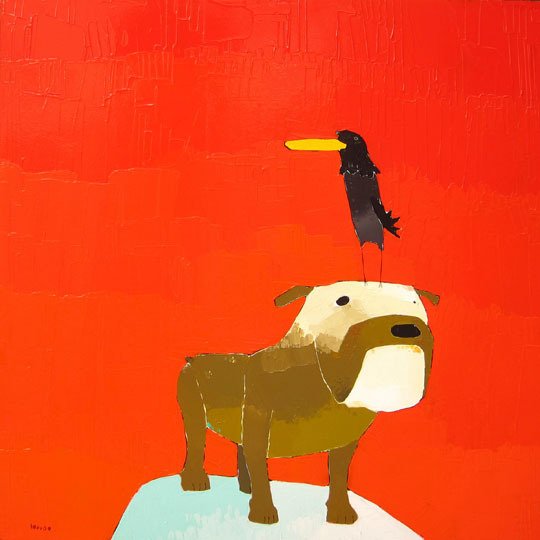 Animals also are a favorite image for Trevor Mikula. His creatures bear a faint resemblance to their realistic sisters and brothers, but for the most part, they are all fantasy and humor. ﻿﻿﻿I often start with an idea for a title, usually a play on words, and then I take off from there," he said. He is drawn to "crazy ideas that make me laugh," such as the fierce "Bulldog" with the annoying bird on its head. "You Drive Me Cuckoo" (shown at the top of this post) is definitely open to interpretations, although the gist of it is very clear! Trevor has a youthful, naïf style that is very happy. His colorful images painted with palette knifes always put a big smile on my face. He can take a plain camel, name it Alice and give it a special look that’s far better than reality. Who needs reality, anyway, when you can have art? Who says fruits & veggies are just for eating? Still life paintings have always been a favorite subject for artists. Some painters, like my friend Joyce, paint floral arrangements exclusively. But others prefer fruits and vegetables. Why? In my own case, I love the organic shape of "produce." I actually spent a few years just painting pears! For those of us who are colorists, you can’t beat the hues of fruits and veggies. I’m drawn to these objects in a seasonal way, and seem to want to paint them in summer and fall when they are fresh at a farmers’ market. 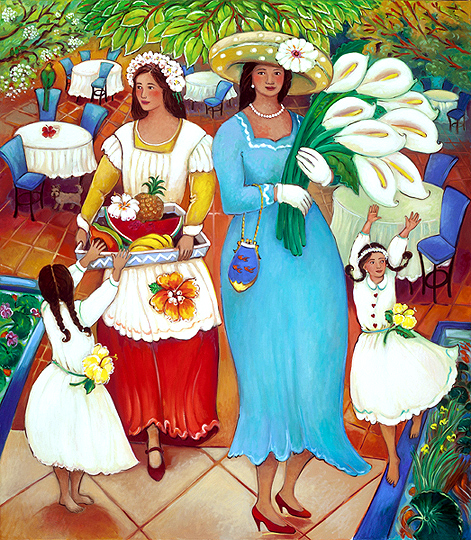 Stephen Morath depicts edible arrangements in a classical, Italian style, yet his colors are so much more vibrant. He told me that he likes to garden and be amongst the fruits and vegetables he grows, and also is inspired to paint them in late summer and fall. depicts edible arrangements in a classical, Italian style, yet his colors are so much more vibrant. He told me that he likes to garden and be amongst the fruits and vegetables he grows, and also is inspired to paint them in late summer and fall. "I like to grow some exotic squash like crooked neck and paddy pan because of their unique shapes," he said. I guess I’m always thinking of how they would look in a painting." I definitely agree with Stephen when he said that painting fruits and vegetables is a respite from more complicated works. 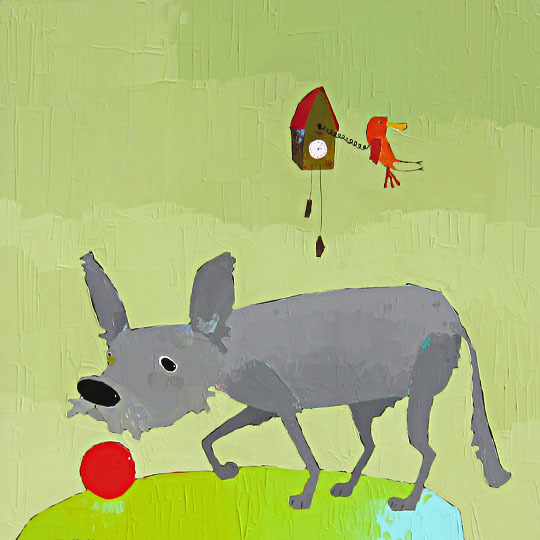 However, his still life paintings are anything but simple. 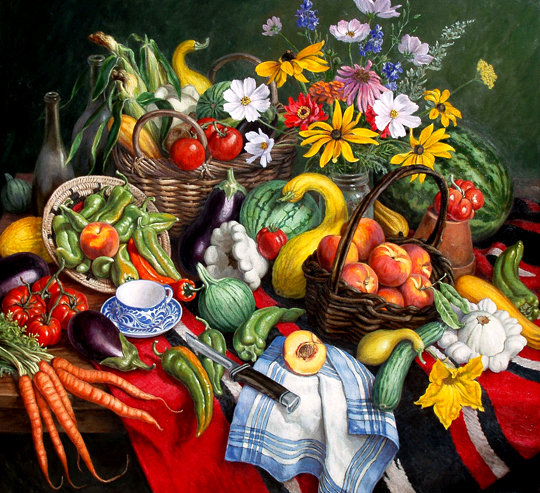 As you can see in "From the August Garden," considerable work has gone into arranging and painting this assortment of fruits, vegetables and flowers. I can sense the bounty of a late summer harvest when I look at it. His excellent rendering of the cool blue and white cloth napkin, teacup and knife are a wonderful contrast to the colorful produce on the table. 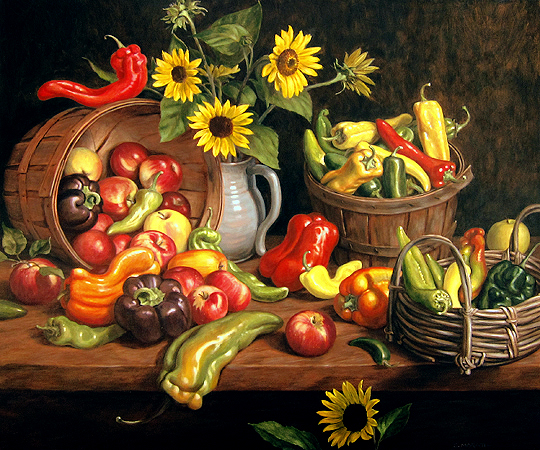 In his painting entitled "Peppers and Apples," Stephen focuses on the interesting shapes and colors of curvy peppers, placed among round apples and bright yellow sunflowers. For Linda Carter Holman, fruits are a secondary element in her paintings – part of the setting she creates. "When I plan a painting, I often think about creating a party, so there’s always a person, sometimes an animal, a table with flowers and some fruit," she said. "I use accessories that have meaning to me and create an inviting environment." You can see a typical scene Linda creates in her painting entitled "Standing in Blue." There are times, however, when produce takes front stage in Linda’s painting. 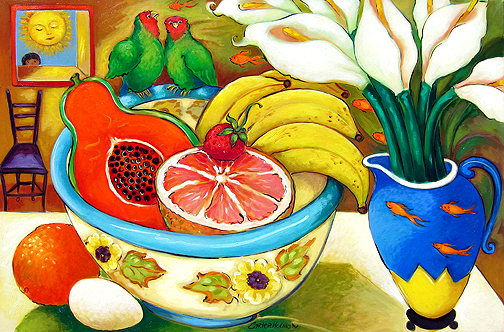 The bowl in "Mystery of Life Four" is the focal point, full of luscious fruits. But Linda still creates a setting, with some of her favorite "accessories" such as the love birds perched on the bowl and the goldfish vase with calla lilies. It’s a little too early for produce inspiration, but watch out for other beautiful still life paintings later in the summer!